This Christmas we designed and coded three fantastic festive animated emailers for our clients to spread some holiday cheer! 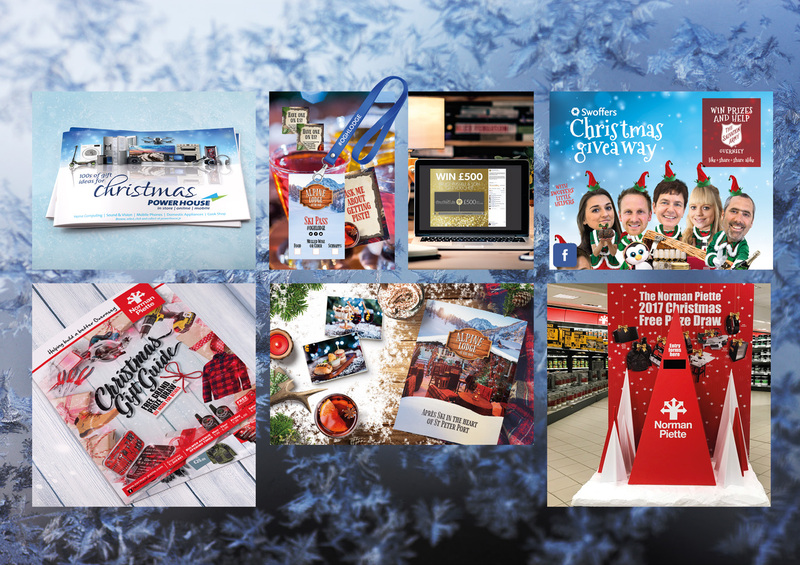 The annual Powerhouse Christmas Catalogue landed on every door step in Jersey in November and we’re delighted to have been responsible for the creative and printing of the bumper 52pp brochure which features all of the latest technology from phones, tablets and laptops to audio visual and domestic appliances. Door drops remain an effective way to reach a wide audience in both Guernsey and Jersey and can be used for awareness or to generate sales for a variety of products and services. If you’d like to know more about how we could help your business, just get in touch. We’ve been working on an fantastic project for The Old Government House Hotel and Spa. This festive season their rooftop terrace was transformed into The Alpine Lodge complete with snowy scenery, warming comfort food & beers served in steins! We designed the branding for the look and feel of the promotional material, produced a stylish four page brochure and organised the distribution for a corporate door drop. We then supplied drinks menus, customisable framed portraits for the chef’s dish of the day. Plus we also produced several thousand bespoke ski passes for branded lanyards and to add a bit of festive cheer, clip on free drinks tokens. The final aspect of the project involved cladding the scaffolding on the outside of the lodge, to keep it looking rustic. We created a mammoth sized weatherproof banner to wrap up the whole project. All that was left to do was to drop in for an exclusive preview evening and to sample the schnapps. The Alpine Lodge is open till the 6th January 2018, so you still have time to don those ski pants and enjoy a truly unique Aprés Ski experience at The OGH! Social media platforms provide the perfect opportunity for clients to achieve a presence, increase brand awareness and engage with their customers. With a tight turnaround for the Christmas period, Bruce Russell & Son approached us wanting to achieve all of the above and more. We setup, branded and launched their new Facebook page – tied in with a voucher competition and post promoting 20% off in-store throughout December. In just over three weeks since launching, the Bruce Russell & Son Facebook page now has over 2,200 followers and posts reaching nearly 80,000 Facebook users! With the aim of increasing social media followers and providing an opportunity for our client, Swoffers, to give back to the community, Hamilton Brooke devised a Christmas campaign that is already yielding results. The concept was simple, a suitably festive giveaway every day for 20 days to increase likes on Facebook and, to give that little bit more to the community, a duplicate of each prize would be put into a giant hamper and donated to a charity. Bringing the promotion to life though required a greater effort. We designed the look and feel of the promotion, complete with Swoffers Elves and used this as the base for social media mastheads as well as a window graphic and point of sale for the offices. A list of festive prizes was complied and these were sourced, purchased and wrapped carefully with ribbon and individually branded tags. We created a festive set and, with the tree trimmed and the fire burning in the background, directed a HD promotional video of the hamper being filled by Swoffers Elves. This teaser video had a great response with viewers liking, sharing and tagging their friends too, and the daily prize posts reaching in excess of 100,000 unique users. Another example of how to use social media effectively and integrate digital and ambient marketing with CSR and PR. Competitions are great at encouraging engagement with existing customers and attracting new ones. Whether they are run online to boost social media following, or offline to drive footfall in store, they give something back to consumers for interacting with your business. The Christmas flyer we designed for Norman Piette Ltd features a competition mechanism that requires entrants to call in to the Building Centre and so needed somewhere to accept all of the entries. We created a simple and eye-catching display that complements the flyer and is of course suitably festive!